Paris had lots in store for us, even during the last leg of our time there. By this point, temperatures had dipped quite a bit, so it was time to bundle up in boots, scarves and cozy knits before heading out for our daily adventures. My camel cape was the perfect warm yet chic piece of outerwear to wear over top - yes, it definitely weighed down my suitcase dragging all my coats around, but considering your outwear is what gets seen the most when on a fall/winter trip, I think it's worthwhile taking on the extra suitcase weight. 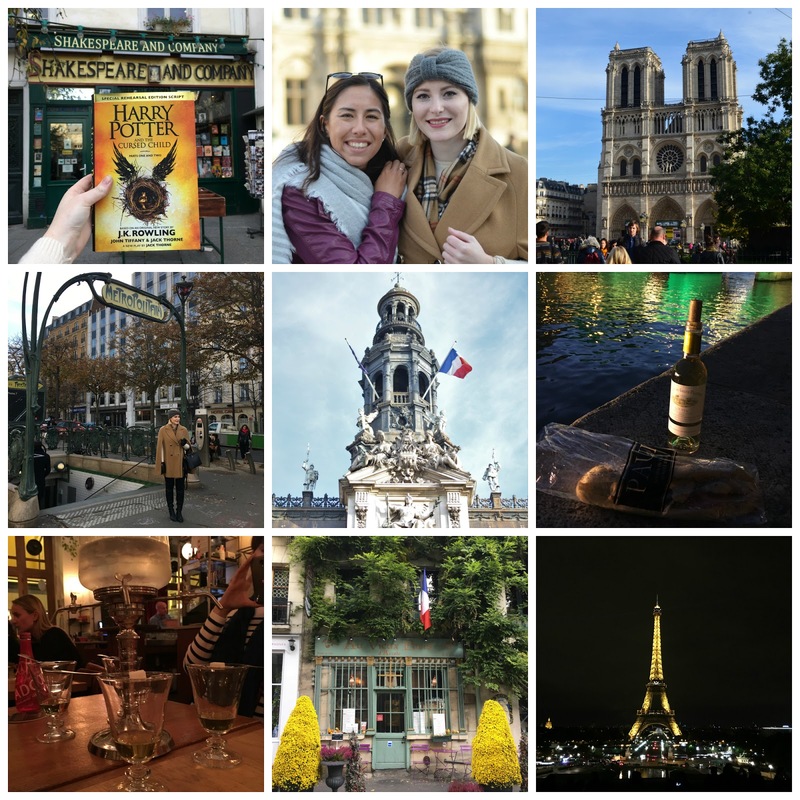 During the next part of our time in Paris, we did a self-guided walking tour in the area of Ile de la Cité and Le Marais, where we made a stop for a photo op at Notre Dame, and Shakespeare and Company. Going to Shakespeare and Company had been on the bucket list for a few of us, and since the new Harry Potter script for The Cursed Child had just come out not that long ago, we wanted to buy our copies there and have them stamped with the Shakespeare and Co. stamp! A special momento from the trip. We wandered past a couple more landmarks on our walking tour before getting sidetracked by other sights...it's hard not to in Paris! We stumbled upon Hotel de Ville, where the outfit photos below were taken. Two more activities that were on our must-do list were having lunch/dinner along the Seine, and trying absinthe for the first time at La Fée Verte. Our dinner on the Seine was a perfect evening; we found some delicious paninis nearby, grabbed a few bottles of wine, and sat along the water after the sun had gone down. La Fée Verte was an equally good night; we picked our absinthe from a long list of choices, and had it served with the large water dropper, sugar cubes and absinthe spoons. It was quite the contraption! But essentially, you dilute your absinthe as the water drips from the reservoir, over the sugar cube and into the glass. Fair warning though if you don't like the taste of black licorice, the flavour is anise - something my friends weren't crazy about, but I didn't mind at all! Traditionally, it was a drink consumed by Parisian artists and writers in 19th and early 20th-century France. A fun dose of history! Finally, we couldn't leave Paris without seeing the best view of the Eiffel Tower from Le Trocadero! We grabbed some champagne and sat on a bench along the fountains, watching the twinkling lights on the Eiffel Tower at the top of the hour. Perfection.